Imagine carrying around a 10 or 20-pound bag all day long, every day. That would get old fast. Being overweight gets old too, yet there are many reasons why it can be difficult to release those unwanted pounds that have become a burden, both physically and emotionally. Hypnosis leads to effectiveness for shedding the excess baggage for good! If you are struggling with weight release, you have most likely programmed your mind to believe that when you make yourself temporarily feel good by eating unhealthy foods or overeating. Because the job of your subconscious mind is to keep you safe, we can easily reveal the truth to your subconscious while you are in a meditative, hypnotic state. The truth is that being safe means being healthy and fit. It means getting rid of that weight that is bogging you down and having energy and a zest for life like never before. It means making choices that are good for you in the long run, not the choices that placate the stressed or wounded child within. With the Weight Release Hypnosis Meditation, you will be more relaxed, cope with stress better, make better food choices and desire to move your body more, staying in the flow of life. There is no easier, faster and more effective way to lose weight. Just listen and soon you will be effortless behavior modifications that will lead to a more fruitful life. 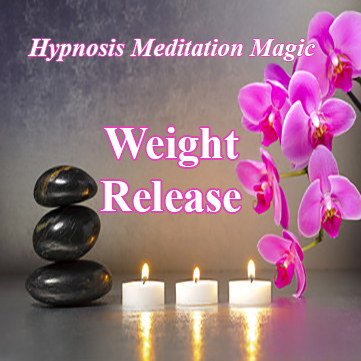 Enjoy this hypnotic weight release meditation now. The only thing you have to lose is your waist. You will LOVE this meditation and what this meditation will do for you!